Nowadays, we find that more and more people, especially the young people, tend to go out for a walk with headphones. It is a fact that music will give us a delightful life. To seek for the perfect sound quality, many people use an iPod device as a portable player because it is one of the greatest innovations on music player. However, it's clear that we know nothing comes perfect. More and more iPod users have met the problem of storage limitation with the growing songs, and they also have faced the high risk of data losing on the iPod touch/nano/shuffle. So is it a way to backup the iPod songs and free up more storage space without deleting? The Answer is absolutely YES. Obviously, transferring songs from iPod to Mac or Windows computer could be a good way to avoid data losing and free up space. But, how can you reach the goal? We all know that iTunes is a one-way transfer software which only allows users to import all your favorite songs from Mac to iPod, but not enables users to export music from iDevice to desktop computer. Under this situation, you need to find an easy to use yet reliable iPod Music Transfer for Mac program as your assistant. 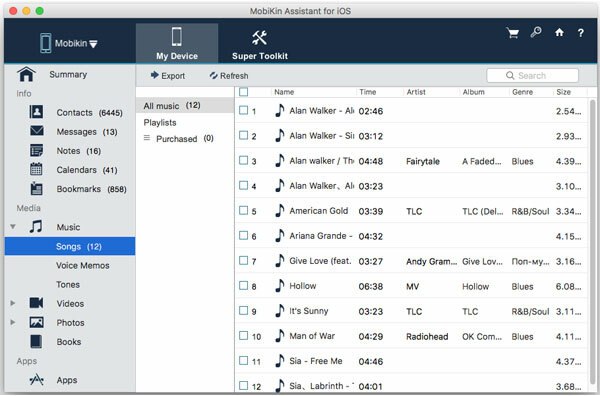 These kinds of program is a professional helper for all iPod, iPhone and iPad users, which can easily copy media files from iOS devices to Mac. And it also allows users to move other data like photos, podcasts, iTunes U, books, etc. from your iPod touch, iPod nano and iPod shuffle to Mac or Windows computer. 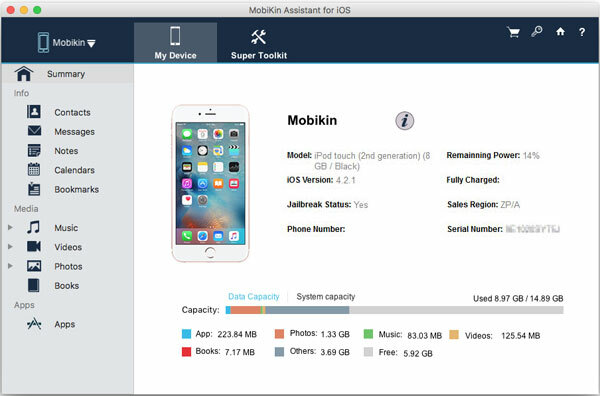 It is no doubt that there are lots of similar transfer program on the market, but if you trust me, here my recommendation is MobiKin Assistant for iOS (Mac Version) and MobiKin Assistant for iOS (Windows Version). It offers you an extremely easy way to backup music from iPod to Mac in only several clicks. So, you don’t need too much knowledge about information technology to deal with it. Furthermore, it is in line with various iOS devices, including iPad, iPad 2, iPad 3 (the new iPad), iPad Air,iPhone 4/4S, iPhone X/8/7/6S/6 as well as all iPod models. Just like what you've seen, the Windows and Mac version are all available here. You can select one of them and install it on your personal PC according to its operating system. Here, we could like to take the Mac version as an example, if you're a Windows user, you can read the following contents and perform the Windows version to export and save iPod music on computer by yourself. Firstly, download and install the program on your Mac computer completely. Secondly, connect your iPod touch, iPod nano, iPod shuffle or iPod classic to your Mac, then launch the program. Wait a few seconds of device detection, the detailed information of your iPod, including the type of device, the version of system and the capacity, will be shown in the main interface just like below. Thirdly, click "Music" option in the left panel and all music list will be displayed in the right panel. So you can get a preview of the songs' list and choose the target songs. After that, click "Export" button to complete the process. 1. How to locate the music I have copied to the Mac? Q: You can click "File -> Open Export Folder", the software will export your selected songs to the default folder as it was installed, if you copy music from iPhone to Mac exactly as above showed. 2. How to transfer music to a specified file folder on my Mac computer? Q: You can click "Advanced -> Options" to change the export folder before you start copying music from your device.